Over the past 4 weeks, models have been gliding down the runway showing the Hottest Fashions for Spring from all the Top Designers. Sadly, with Spring 2014 Fashion Week ending yesterday. Here are some of my favorite moments from this Stellar Spring season. Look through my reviews from all your favorite collections for Spring. And don’t forget to tell me your favorites in the comments. Celebrating 30 years at the house of Moschino, Creative Director Rosella Jardini begins her collection, showing off a few pieces representing her years at the house of Moschino. Then switching into a Beautiful collection, with none other than a Good Girl vs Bad Girl Theme. “The Good Girls” showed off Beautiful Chiffon, Silk, and tweed ensembles. Many of which were in a tutu style. 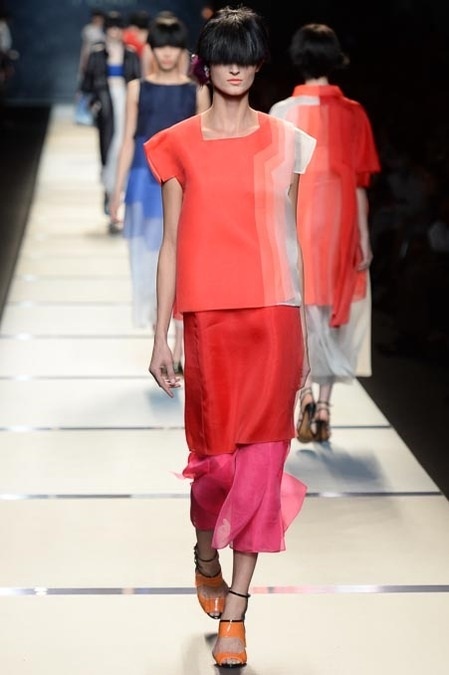 Sweet colors of Pink, Red, Black, Cream, and White were seen a lot. 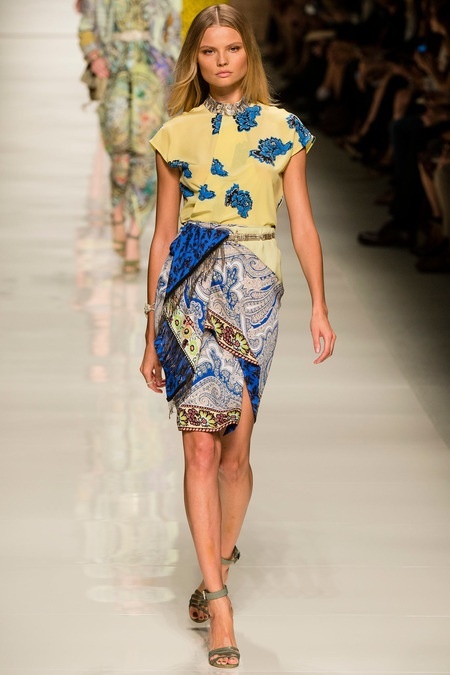 With many flirty Floral print dresses, really bringing such a Glamour and Romance. A vibe seen throughout all the cities so far at Fashion Week. Like many designers including feminine accents, Jardini includes her edgy and Punk accents with “The Bad Girls.” Showing off leather jackets, chains, and ripped up denim. The Moschino Girl is definately ready to look edgy for Spring. Representing the 30 years of Moschino, Jardini sends out some of our old favorite Supermodels, (aka Alek Wek, Jodie Kidd, and Erin O’Connor), amongst a few. In some of Moschino’s most memorable pieces. And the finale, with live singing. One Word: Speechless. 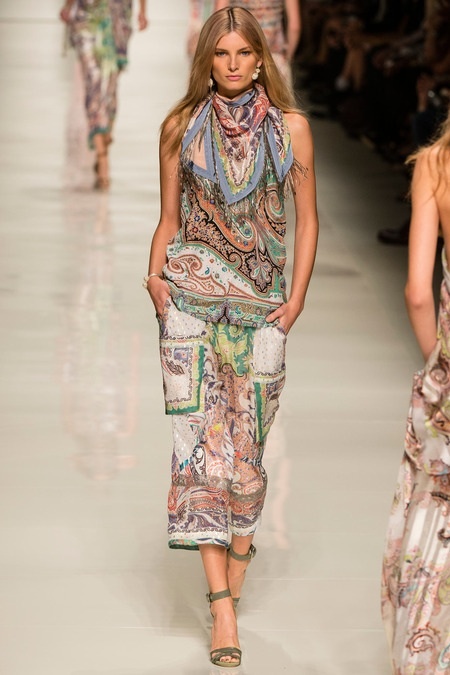 Veronica Etro mixed many Beautiful prints of: Paisley, Snakeskin, Flowers, and even Geometric. 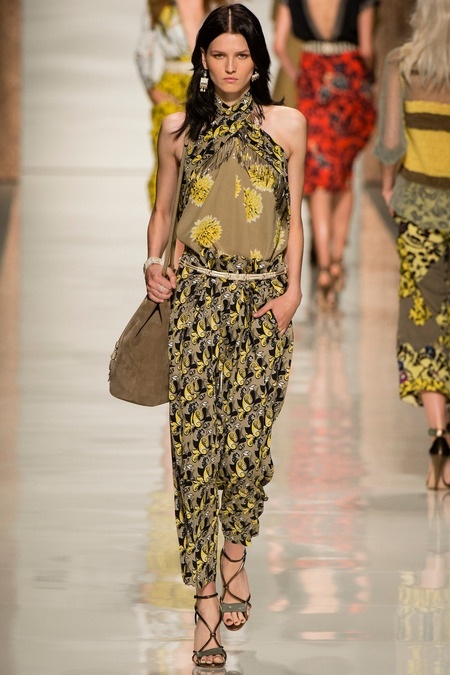 The collection really has that Bohemian vibe, but also has such a Chic ‘Let’s Go on a Safari‘ vibe, seen at many of the shows this Spring 2014 Fashion Week. Making me really wish I could go on an expedition to Bora Bora right now. 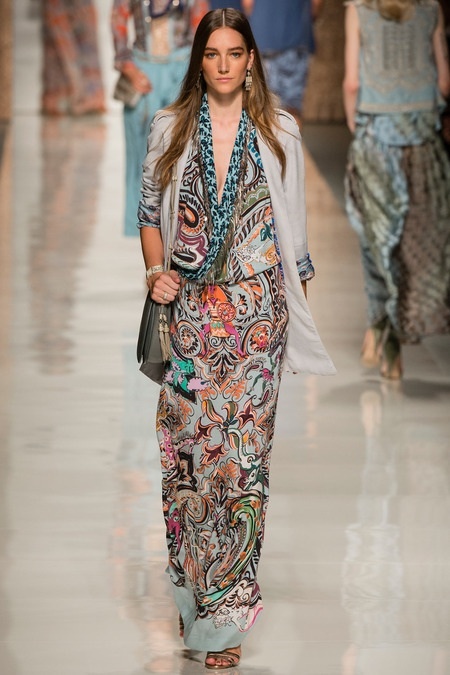 Etro uses many styles of Maxi dresses, Jumpsuits, and Many long and Flowy dresses. Strapless, or with sleeves. Perfect for an all night party in Malibu. 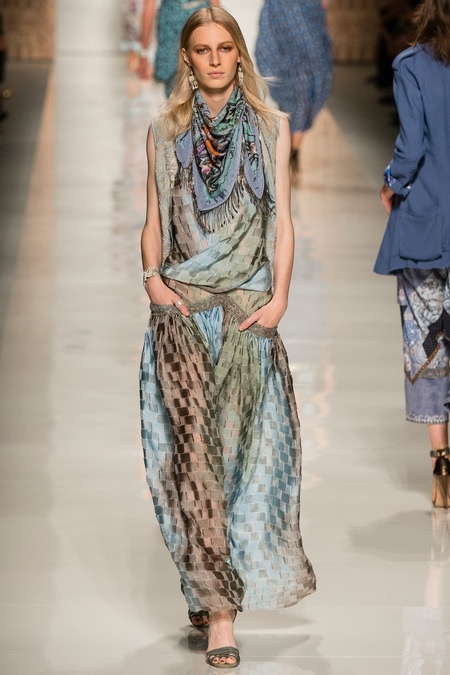 Really bringing in such a Stunning, Beachy collection, while definately having that signature Etro vibe. 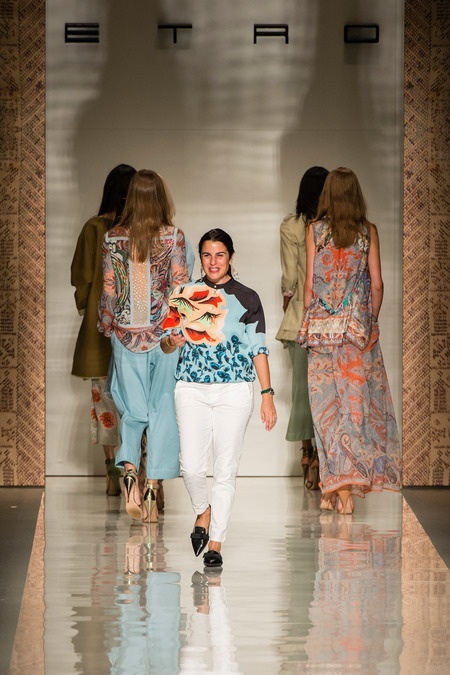 What would make an Etro collection, an Etro collection without prints? 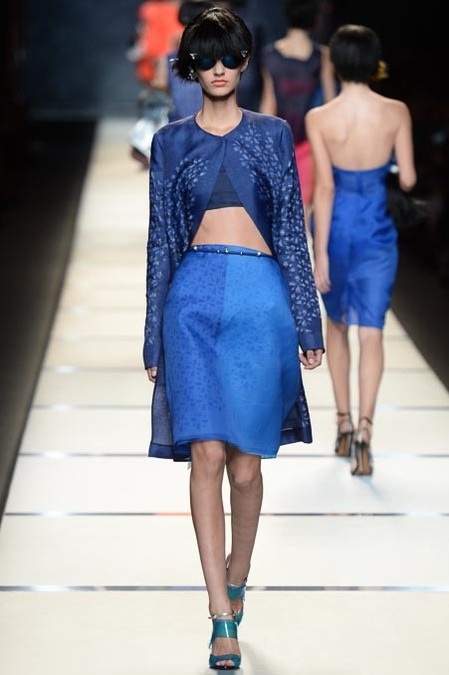 As Day 2 of Milan Fashion Week is just ending, I go back 7 months ago to when the Fall 2013 collections were showing in Milan. 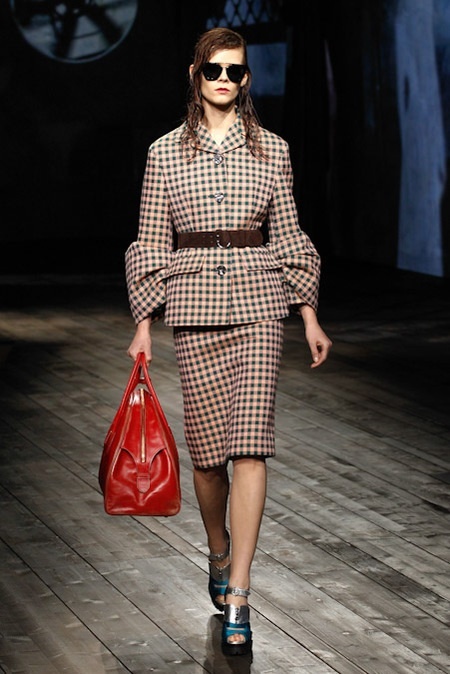 Comment your favorite moments from Milan Fall 2013 Fashion Week in the comments. 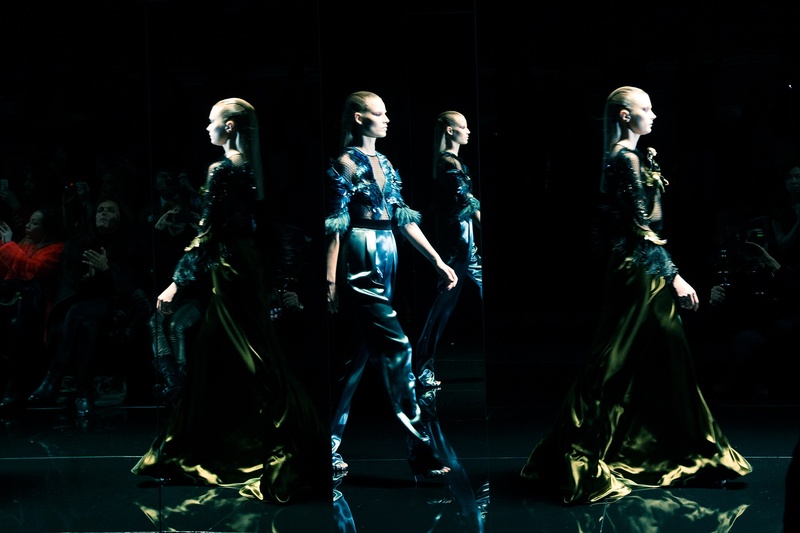 Julia Nobis leads the finale at Emilio Pucci‘s 70s inspired show. 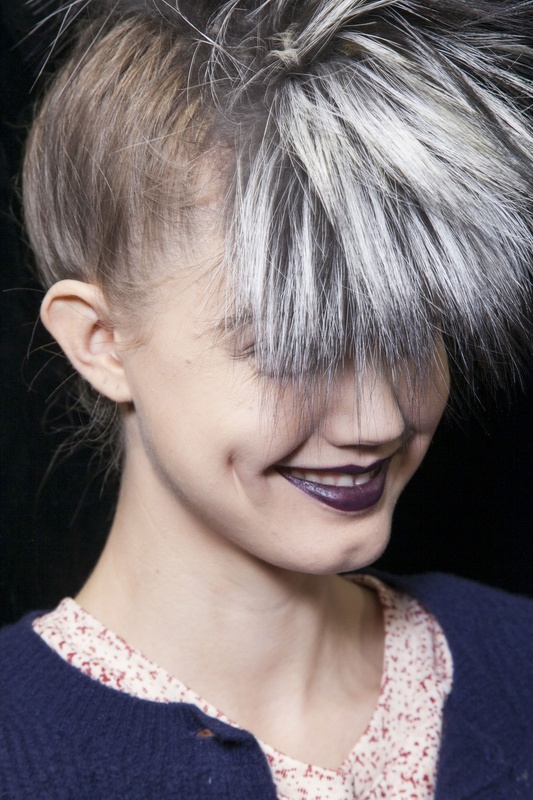 It’s all about the fringe! If you have something you think would be great in being a part of Throwback Thursday, just email me the photo to, buttersthompsonrocks@gmail.com, with the subject, Throwback Thursday for your chance for your chance to have that image featured as the Throwback Thursday! Remember: Images at the most recent can be from 1 Week ago. 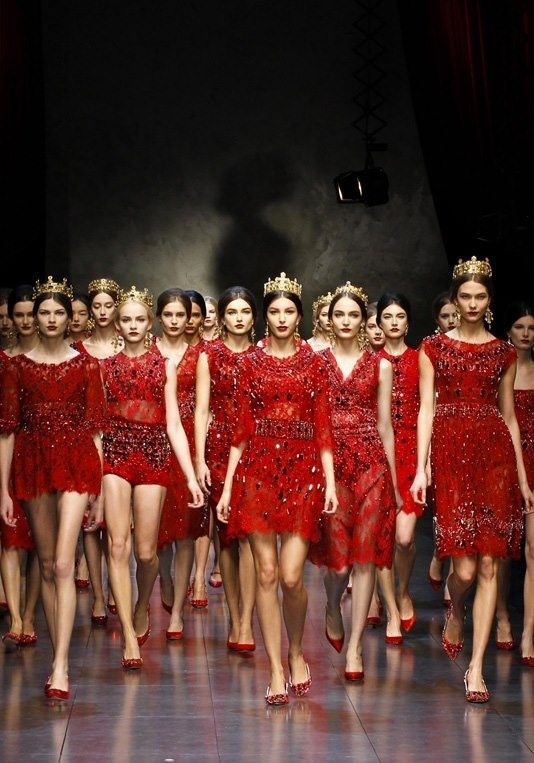 Make sure to come back, next Thursday, to see my Favorite Moments from Paris Fall 2013 Fashion Week, and come back the following Thursday to see my favorite moments from Spring 2014 Fashion Week. 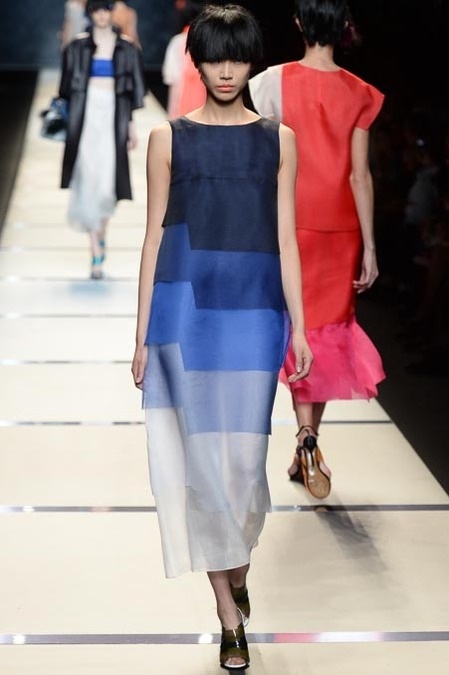 It’s 50 Shades of Pink and Blue at Fendi Spring 2014! 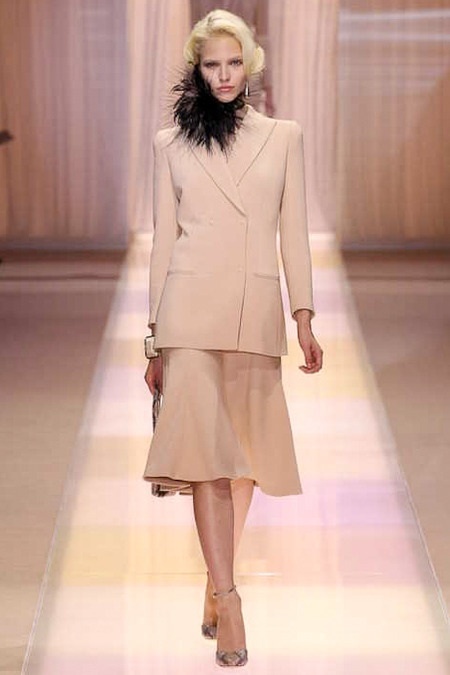 As Karl Lagerfeld designs a Beautiful collection, using lots of sheer fabric, ruffles, and many different fabric styles. From tieing cute little bows, to structured ruffles, to tops layered over another top, and even over skirts. 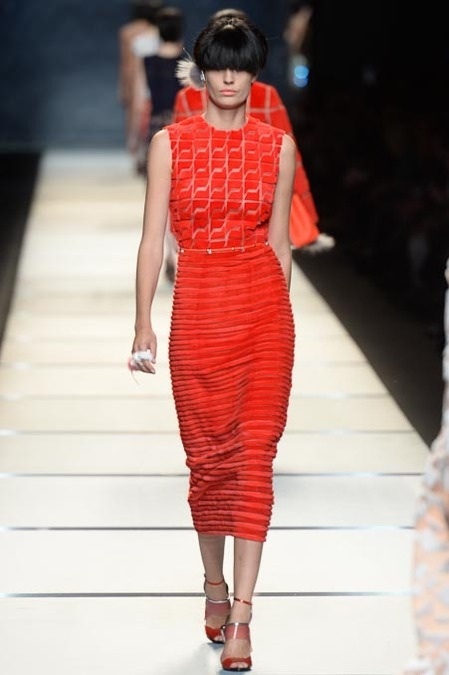 For a very Structured, free expression feel, seen at many of the Spring 2014 shows so far. 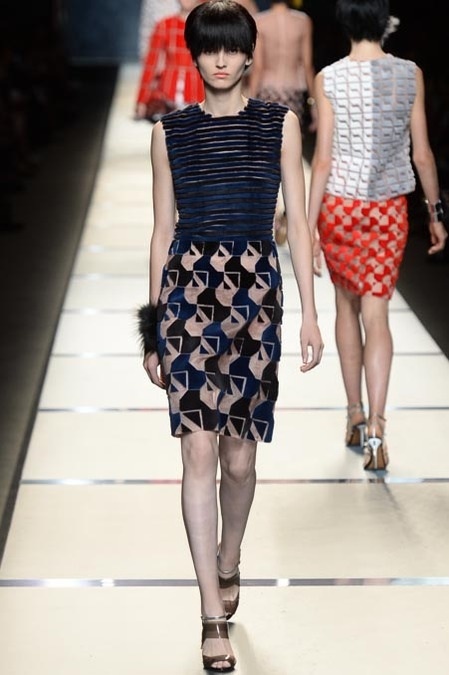 Towards the end of the collection, Lagerfeld incporates Geometric prints, very Fendi and bringing me lots of reminiscence to Fendi’s Spring 2009 and 2013 collection. Along with an array of Beautiful Sparkled Cocktail like dresses. 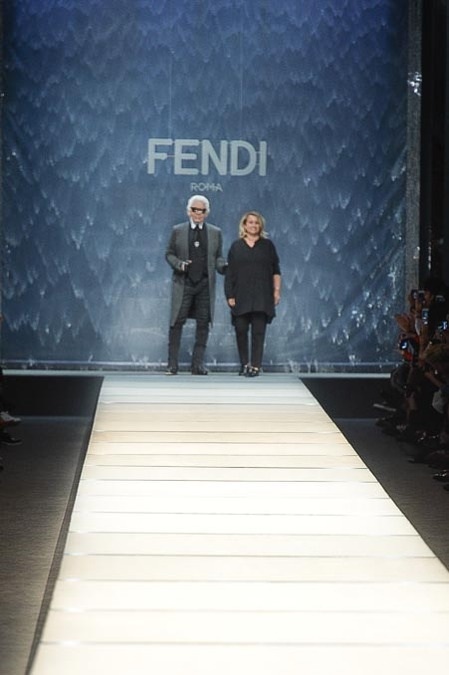 A fur Fendi clutch for Fall 2014 Fashion Week? Yes please!